* Foreign Language is a UNC system requirement. Required: Proficiency through the 201 level in a language previously studied, or the 102 level in a "second" foreign language not previously studied. Students will demonstrate proficiency by completing a course at 201 level or higher in a language previously studied depending on placement, or through the 102 level in a language not previously studied. In regards to the foreign language requirement, no disability-related documentation should be sent to, nor will be accepted by, the World Languages & Cultures department Chairperson or staff. Instead, the students are directed to speak with a staff member at the Disability Resource Center (DRC). Students with documented disabilities through the DRC for whom foreign language learning is not possible are directed to the Chair of World Languages & Cultures, Dr. Derrick Miller. First-year students wishing to continue in the language, for which they have two or more units in high school, must use the placement tool. Student placing into 102 or 120 will need to complete the sequence through 201 with passing grades to satisfy the requirement. Student placing into 201 or above will need to pass the class to satisfy the WL requirement. First-year students wishing to study another language other than the one for which they have two or more units of in HS and for which they have no previous instruction, but wishes to go into different language with no previous instruction must complete 102 the sequence through 102 with passing grades in order to satisfy the WL requirement. If the student places into 120 or 102 (and passes), the student will also need to take 201 (and passes) to satisfy the requirements. If the student places into 201 or above (and passes), the FL requirement will be satisfied. 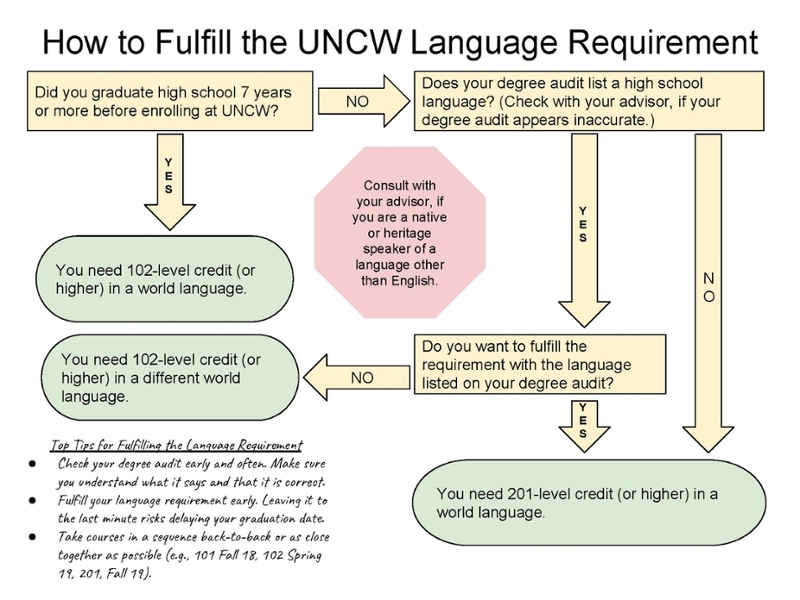 If the transfer student transfers a college Foreign Language course from the same language taken in high school, then the student can enroll in the next level course at UNCW until the 201 level is completed successfully. If the transfer student transfers a college Foreign Language course from the same language taken in high school at the equivalent of our 201 level, then the requirement is satisfied. If the transfer student transfers a college Foreign Language course from a language different than taken in high school, then the student can satisfy the language requirement if they transferred in the equivalent of the 102 level. If the student has only transferred in a 101 level language course, they must take 102 here at UNCW to complete this particular requirement. Students are required to demonstrate proficiency through at least the Intermediate I level by completing a course at the 201 level or higher in a language they have studied previously through the language placement test. If a student begins a language not previously studied, they are required to attain the 102 level in that second foreign language. Most students continuing in the language studied in high school will likely take 3-6 hours from this component. Students who graduated high school more than 7 years prior to matriculation at UNCW are required to demonstrate proficiency at or above the Beginner II level by completing a course at the 102 or 120 level in any language, or by completing a higher level based on a language placement test score. Any student with sufficient background may elect to fulfill the language requirement by CLEP examination, which can provide academic credit at the 201 level or above. All: It is important that you pull your degree audit frequently to double check that your WLC requirements are cleared. All: Students with no HS language at all must complete up to the 201 level in any language that they chose to study here at UNCW. Please make sure that the language you pick has courses that reach the 201 level before settling on a language track. Seniors: Be cautious that if you need to complete up to the 201 level in a language previously studied, or need to complete 101+102 in a second language previously not studied, that you have planned your academic schedule to accommodate these courses before graduation.